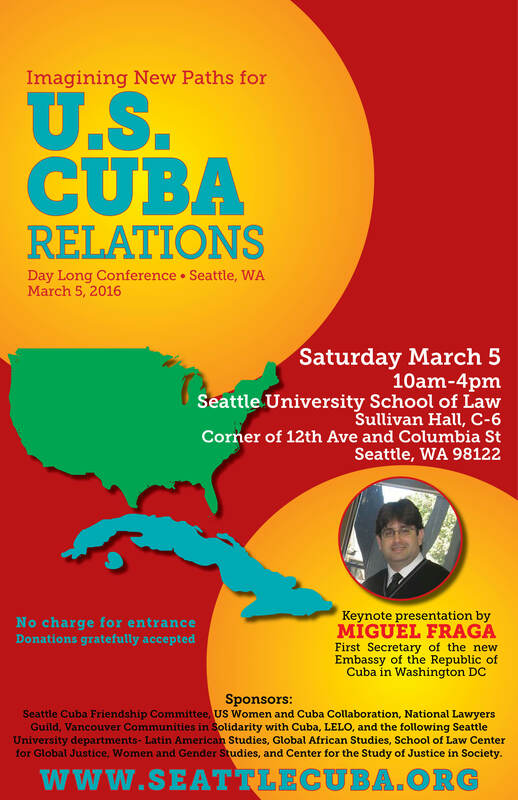 Miguel Fraga,1st secretary of the Cuban Embassy in Washington, DC, speaks in Seattle! The Seattle/Cuba Friendship Committee is proud to announce that Miguel Fraga, the 1st secretary of the newly re-established Embassy of the Republic of Cuba in Washington, DC, will be visiting Seattle from Wednesday, March 2nd, until Sunday, March 6th, 2016. Sunday March 6: he will speak at New Hope Missionary Baptist Church, 124 21st Ave in Seattle on themes including organic agriculture in Cuba, the Church in Cuba, and race in Cuba, 12:00-1:00 (Church service begins 10:45). 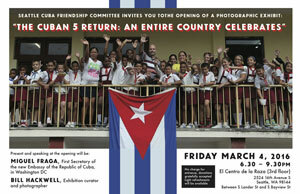 Sponsored by Seattle/Cuba Friendship Committee, US Women and Cuba Collaboration, National Lawyers Guild, Vancouver Communities in Solidarity with Cuba, LELO, and the following Seattle University departments: Latin American Studies, Global African Studies, School of Law Center for Global Justice, Women and Gender Studies, and Center for the Study of Justice in Society.